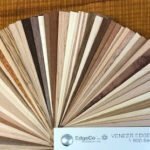 Anigre F/C Wood Veneer Edge Banding Tape - EdgeCo, Inc.EdgeCo, Inc.
Anigre F/C Wood Veneer Edge Banding Tape of over 50 species are in stock and available for same day shipping. Anigre F/C Wood Veneer Edge Banding Tape rolls for automatic edge bander application are 500″ and hot melt coated for iron on or forced hot air application are 250′. EdgeCo’s edge tape from inventory is available in any width slit from master rolls. Also available: EeeZeeEdge Peel and Stick. EeeZeeEdge is a “Simple Solution that Really Sticks”! EdgecCo’s Wood Veneer Edgebanding Tape is Fleece-Backed & Finger Jointed.